We offer EPDM Rubber Profiles & Gaskets. Our range of EPDM Rubber Profiles & Gaskets includes architectural building rubber profiles, bus body building rubber profiles, container seals, Solar PV Modules, moulded components, colour EPDM, expansion joint profiles. EPDM Rubber is the most preferred material the world over. A Thermoset Elastomer, it is amenable to many processes and when vulcanized offers excellent physical properties such as compression set resistance, resistant to cracking, good UV stability, greater flexibility even at lower temperatures, and in addition it is also resistant to steam and moisture. ORPL is a large importer of EPDM Rubber and are abreast of the latest developments in Rubber compounds and their relevant applications. EPDM assumes unmatched versatility and finds usage in a number of Industry-specific requirements. EPDM by far is the lightest rubber in comparison to other types of Rubber. Thus, its final product is longer in length (meter) per unit weight. This characteristic helps increase its spectrum of applications greatly. 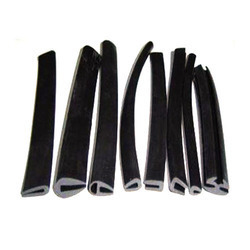 We offer all kinds of U Type Rubber Profile. The ones that maintain an airtight environment in huge shipping containers to preserve the contents during long journeys. The seals effectively prevent air, moisture and dust from entering the containers after closed shut. EPDM – the ideal material OSAKA RUBBER provides permanently elastic sealing profiles made of EPDM rubber (ethylene propylene dien monomer). A study issued by the International Rubber Industry Association proves: EPDM is an optimum raw material for sealing applications. Taking into account cost aspects, the sum of its properties makes it superior to other materials. • UV- and ozone-resistant. Very Favourable cost effectiveness. Note: The Prices of the product varies as per the drawing , design, dimension & specification of the product.